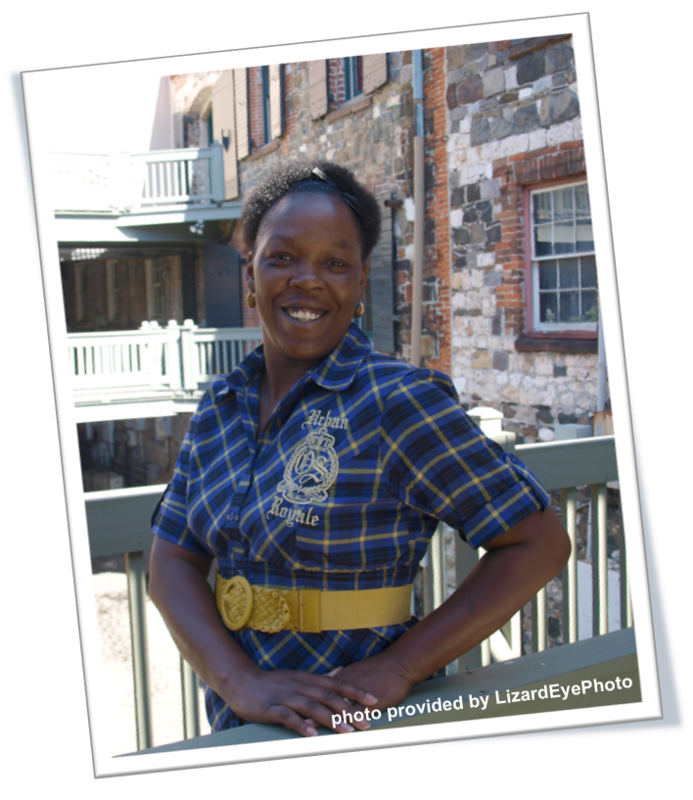 May’s Survivor of the month, Sherray Muhammad, is truly an amazing lady whose story has really affected me. I first met her on the way going down to river street to take her portrait for this article in the elevator. She was radiant and exuded a positive aura. Her hair was tied back with a black bow and she seemed the picture of health. At the time, she had not filled out her questionnaire, so I asked her about her cancer story. After meeting her first and then getting her story later, I didn’t feel that I needed to edit very much since she tells it better than I could paraphrase. This story needs to get out there for younger women to read, “I’m a thirty-two year old African American woman who’s been diagnosed with breast cancer. I was diagnosed on September 28, 2009, a day I’ll never forget. My life has never been the same since that date. I was experiencing an extreme amount of pain in my right breast and found a lump under my right arm. I’d gone to the emergency room where I was told I only had an inflamed lymph node. I was prescribed hydrocodone for ten days and told to follow up with my PCP if I had further complications. The hydrocodone relieved the pain but upon completion, the pain came back worse than ever. One day I was watching a documentary about a singer/songwriter by the name of Minnie Ripperton. In that documentary they spoke about this young woman thirty-one the same age I was who had lost her life in a battle with breast cancer. It was shocking to me that this woman had passed on at such a young age from something like this. The next day I set up an appointment at the local health department, there was a waiting list so the appointment wasn’t for another month. I kept my appointment but by that time my right breast had swollen to the size of a melon and was sensitive to any kind of touch. I told the nurse practitioner about all that I had been going through. She was astonished when I removed my shirt and bra. My breast was red with very defined veins. She felt the lump under my arm and the one in my breast that I had been told in other doctors visits was “nothing to worry about” and ” I had naturally lumpy breasts”. She had me shade in a diagram showing my pains and lumps and told me that she recommended that I get a mammogram immediately. She also stated it might be difficult to get approval because I was so young. She left the room and came back with a Susan G. Komen voucher for me to report to Memorial Medical University to have a mammogram. The mammogram showed some abnormalities so they performed a biopsy on my lumps (the worst pain I ever felt). I believe that was a Thursday. I was told the results wouldn’t be in until the next Monday. Imagine my alarm when I received a call the next afternoon while working. I was told that I had breast cancer and several appointments had been made for me to get an aggressive start on the situation. I met with my surgeon Doctor Ray Rudolph (awesome guy) and Brandy Payne another survivor. I was told that I had the most aggressive form of breast cancer, terminology of which I’m still unclear. This type of breast cancer had formed a mass, was in my lymph node and had attached itself to my skin cells. This meant I wouldn’t be able to just have the mass removed, the entire breast had to go. Me, thirty-one year old me! My breast cancer was in an advanced stage. Within the next ten days I had to have a PET scan, CT and MRI – none of which I was familiar. Then there was treatment, my oncologist Dr.Grant Lewis, another awesome guy, said “We are shooting for cure”. I underwent eighteen weeks of chemotherapy, a double mastectomy (my choice) and a month and a half of radiation. All signs of the breast cancer were gone. Although I had no hair or breasts, I felt great. Slowly over the course of a year of observation I began experiencing back, rib, and pelvic pains. I went to the emergency rooms three times about my back and ribs thinking I’d pulled a muscle or something. Each x-ray revealed nothing “probably just a bruised rib” they said here’s some more hydrocodone for the pain “it should feel fine in a month or two.” During my six-month check-up with my surgeon Dr. Ray Rudolph I told him about the pains I’d been experiencing. To rule anything out, he ordered a body/bone scan. Instead the test revealed the breast cancer had traveled through my lymphatic system to my first and seventh rib, pelvic bone, and skull. There is no surgery for this type of breast cancer; chemotherapy is only used as a control mechanism at this point, and radiation is obsolete. This is it guys, stage four. More MRI, Pet, and CT scans came next and thanks be to God there are no lumps in my brain or any of my organs to date. I’m back on chemotherapy three Wednesdays a month indefinitely. I am extremely grateful to the Susan G. Komen program because without it I may not have made it to see the age of thirty-two, nor would I have the funding to pay for health care. I have met some of the most caring people in affiliation with this program and to each and every one I am eternally grateful. Sherray said that keeping a positive attitude was the key to her living her life now. She also said she was planning on speaking to some groups about her experience as her way of being an advocate. I left her response virtually untouched, because I have two very close friends who were also diagnosed with breast cancer when they were in their twenties and while my friends who are also 32 and 33 years old now, just like Sherray. This story hit very close to home and my hope and my joy being in the position I am to help get this information out to people is to hopefully allow another young woman to read Sherray’s brave words and hopefully save some lives.